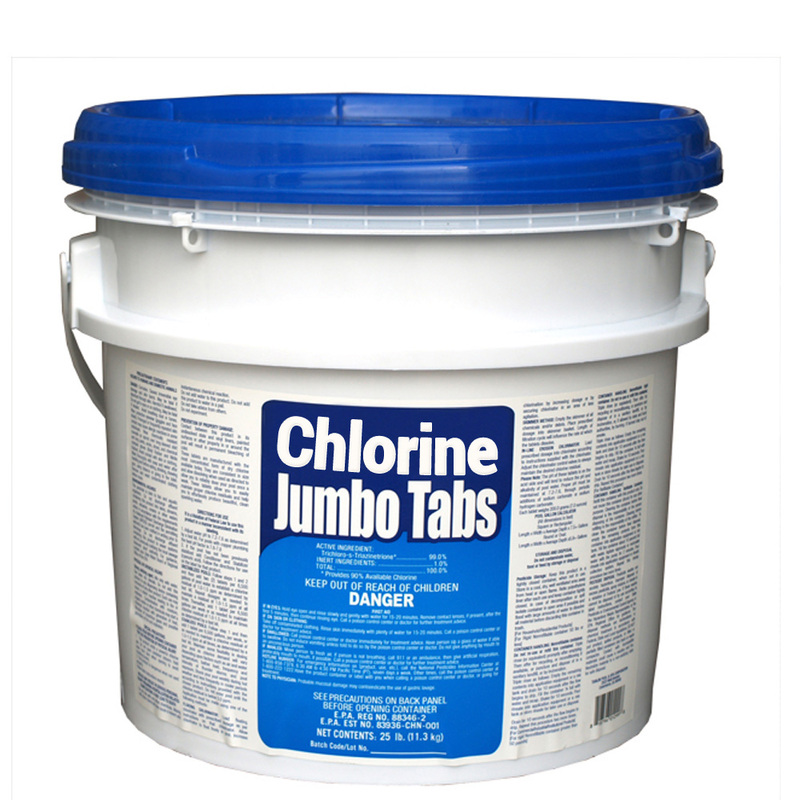 3" Stabilized Chlorine Tablets are a 24 hour Chlorine residual for slow dissolving round the clock product that releases sufficient chlorine to reduce the growth of harmful algae and micro-organisms in your pool. This product needs no filters and has 90% available chlorine. It is slow eroding, which makes it effective for use in plastic skimmers, automatic chlorinators, or floaters. This product also has a long shelf life. This effective stabilized disinfecting agent will safely kill harmful bacteria in your pool. 1 Tablet per 7,500 Gallons per week. 1. Before using Chlorinating Tablets make sure that there is a sufficient chlorine residual (3.5-5.0 ppm) in the swimming pool by super chlorination. Next day add 1 lb. Chlorine Stabilizer (Booster) for each 4,000 gallons of water. 2. Place tablets into a tablet dispenser and float it in the pool or directly into skimmer basket if one is available. In no case should tablets be thrown directly into or on a vinyl liner as bleaching will result. 3. A good pool water test kit should be used at least once a day to check both pH and chlorine levels. pH should be between 7.2-7.6 and adjusted as necessary. Chlorine should be between 1-2 ppm. If chlorine level is too low, add more tablets until there is enough to maintain the 1-2 ppm. This product can be used in any dispenser that uses Chlorine Concentrate tablets or sticks. Should not be mixed with any other kind of chlorine as an explosion could result. NOTE: During heavy bathing loads, very hot weather, rain, etc. and at least once a week, chlorine residual should be raised to 3.5-5.0 ppm with granular chlorine (super chlorinated). It is preferable to do this after swimming day so that pool will have a chance to come back to the 1-2 ppm before swimmers go back in next day. Reentry into treated swimming pools is prohibited above levels of 3 ppm of chlorine. Tablets will last approximately 5-7 days depending upon temperature and amount of water flow.